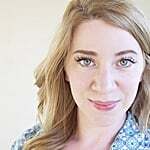 Despite the old "rule" that's still floating around in the most outdated parts of the internet, you do not have to spend three whole paychecks on an engagement ring. There are countless stunning options out there that'll cost you less than $1,000 bucks and make bae's hand look good in all the pictures. We sourced retailers for the most gorgeous, high-quality, truly unique options that won't break the bank, so bust out your Instagram and get ready to sparkle. A cluster of 29 diamonds (weighing .25 carats) come together in James Allen's 14K White Gold Floral Embrace Diamond Engagement Ring ($970). 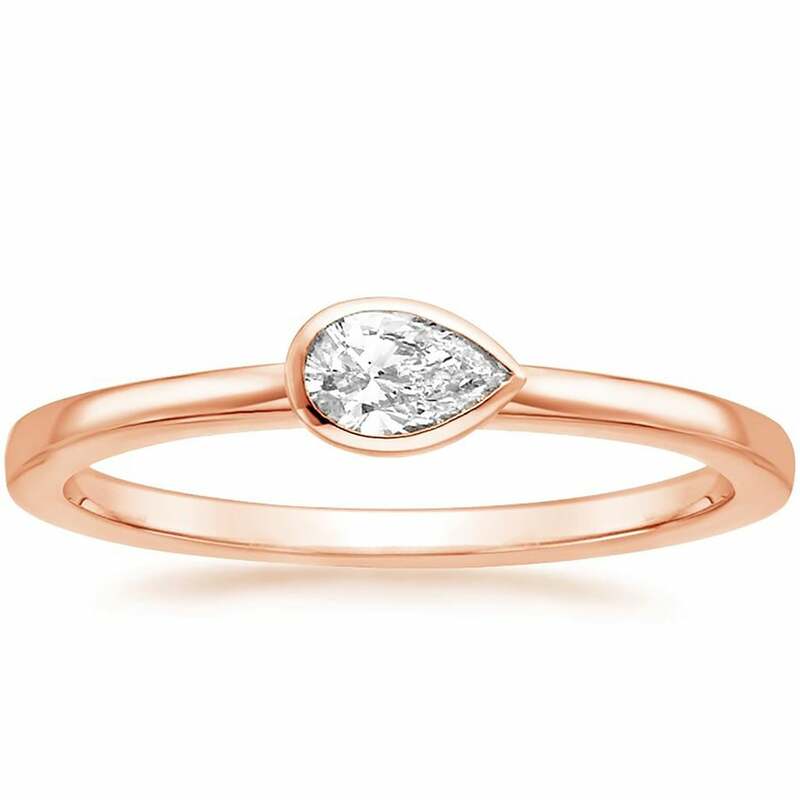 Modernity meets classic beauty in Shane Co.'s Round Bezel-Set White Sapphire Ring in 14k Rose Gold ($450). The center stone is a .49-carat white sapphire, which is less expensive and just as beautiful as a diamond. Concierge Diamonds specializes in personalized, one-of-a-kind rings, which allows you to eliminate anything you don't want to pay for on a ring (like extra diamonds, for example). 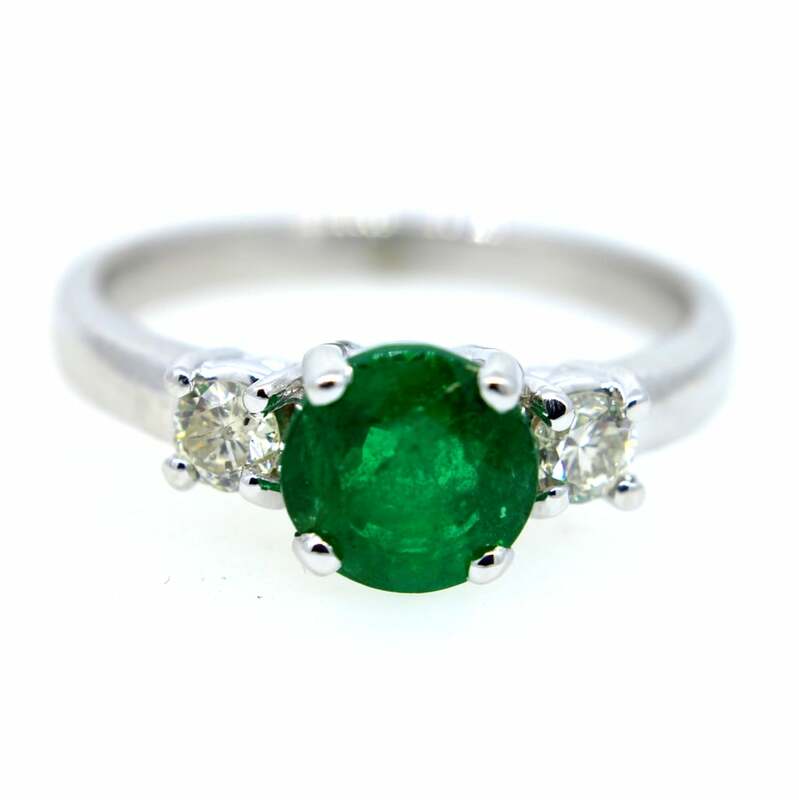 Its Green Emerald & Diamond Engagement Ring ($995) is one example! 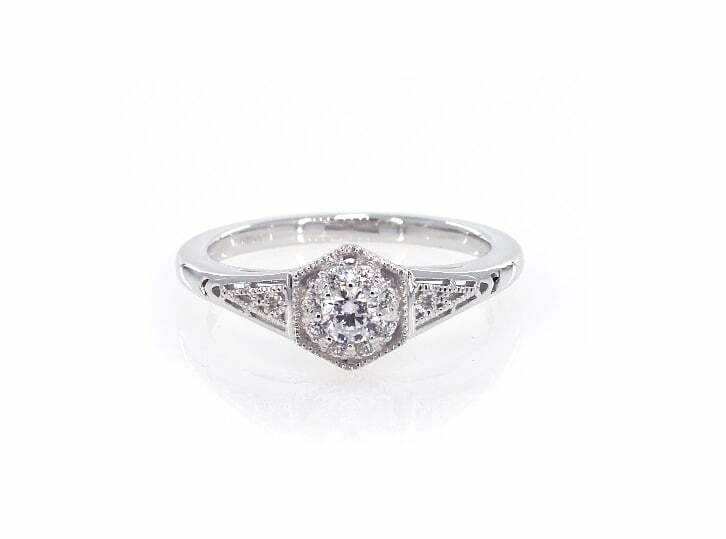 Brilliant Earth sells new and vintage engagement rings. 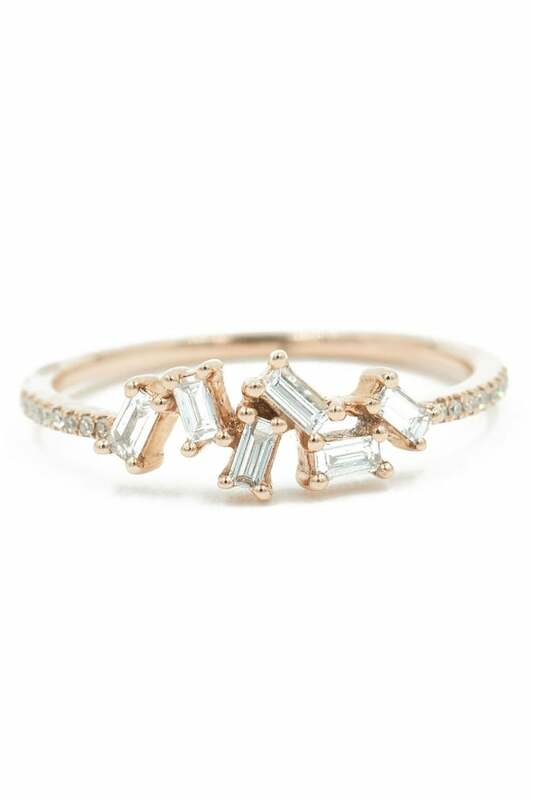 The Ola Ring ($990), which dates back to the Edwardian Era, is vintage and therefore one of a kind. 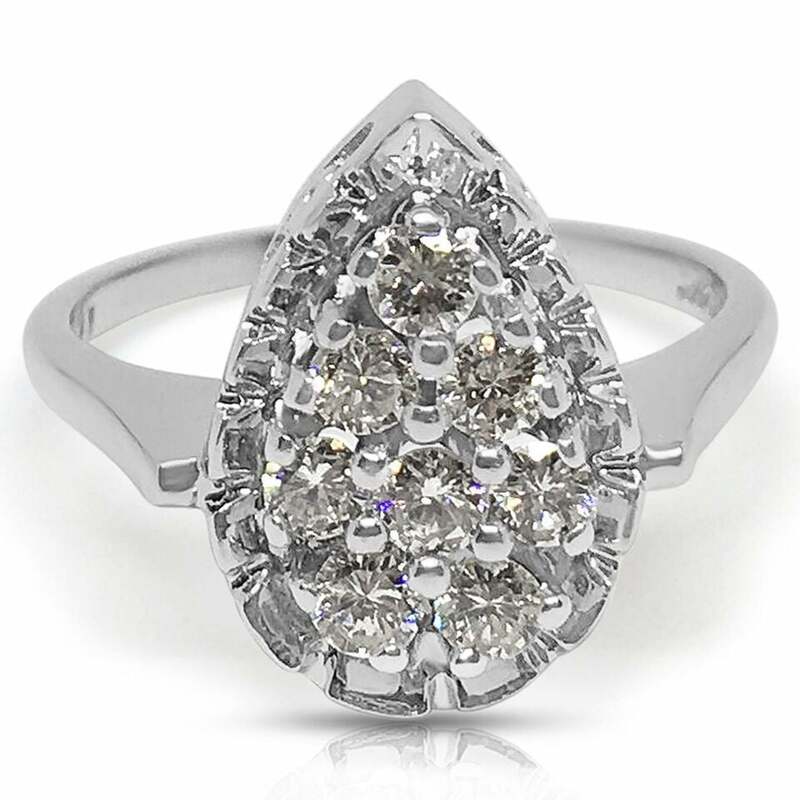 Bright Society's (preowned) Signature 14k White Gold Diamond Ring ($995) features a cluster of diamonds in a teardrop shape weighing in at .54 carats. Diamond Nexus utilizes "diamond alternatives," which are chemically different from a diamond but look nearly identical to a D color, flawless diamond. 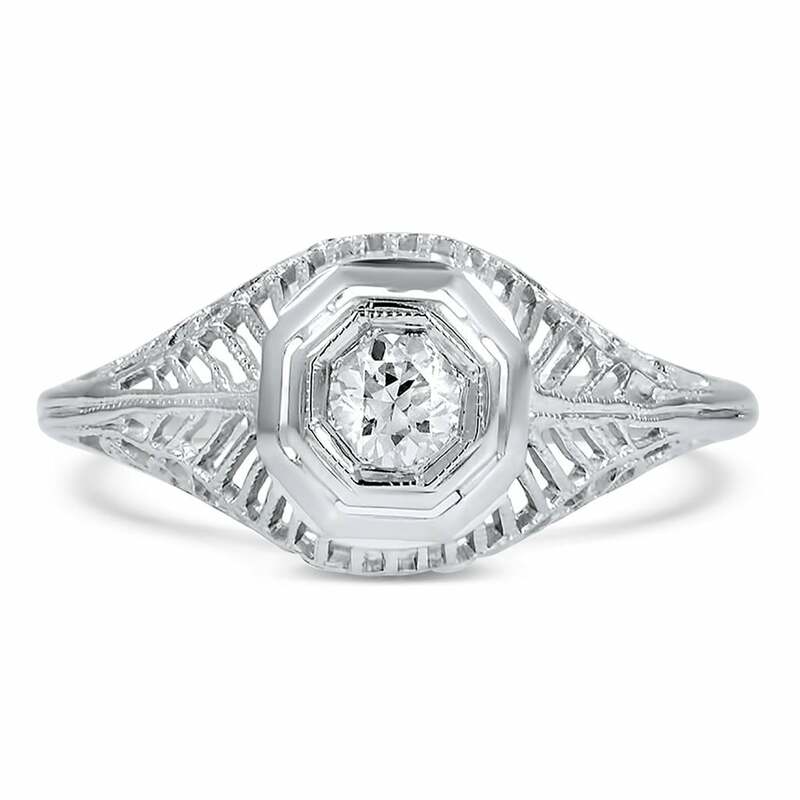 Its Timeless Emerald Cut Engagement Ring ($919) comes in a variety of gold band settings with a .66-carat center stone. How gorgeous is this three-stone Halo Sapphire Ring by Shane Co. ($950)? Three vivid blue sapphires (.56-carat weight) are encircled by a halo of 36 hand-matched diamonds (.18-carat weight). 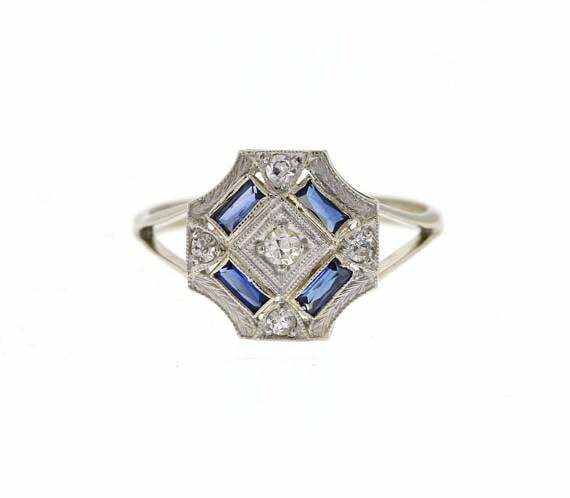 Halo Sapphire Ring by Shane Co.
Etsy is a veritable wonderland of handmade and vintage engagement rings. This Pear-Cut Engagement Ring ($840) is a handmade example and was created by AlyaPersonalized. If you prefer, you can substitute the real diamonds for cubic zirconia, which drops the price to $280. And here's an example of a vintage engagement ring you can find on Etsy. This one ($680) is sold by user OurPersonalGoldsmith and dates back to the art-deco era. It features a geometrical design, typical of the era, with diamond and blue sapphire. 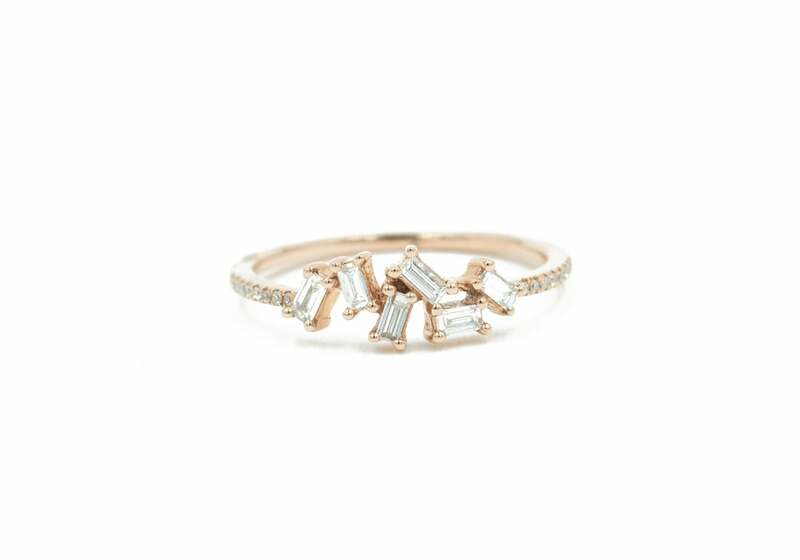 Here's an example of a new, customizable engagement ring from Brilliant Earth. 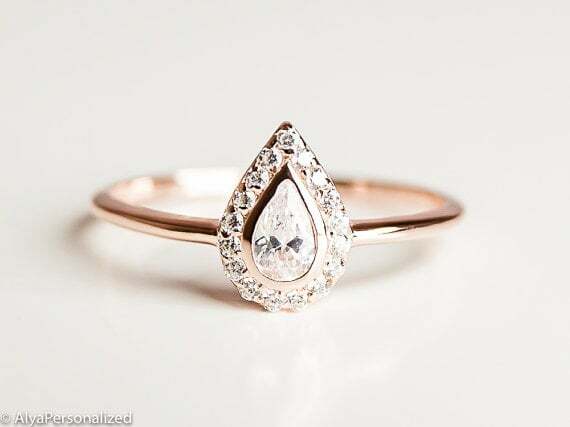 The Pear Bezel Diamond Ring can be made in 14k rose gold, 18k white gold, 18k yellow gold, or platinum (+$300). 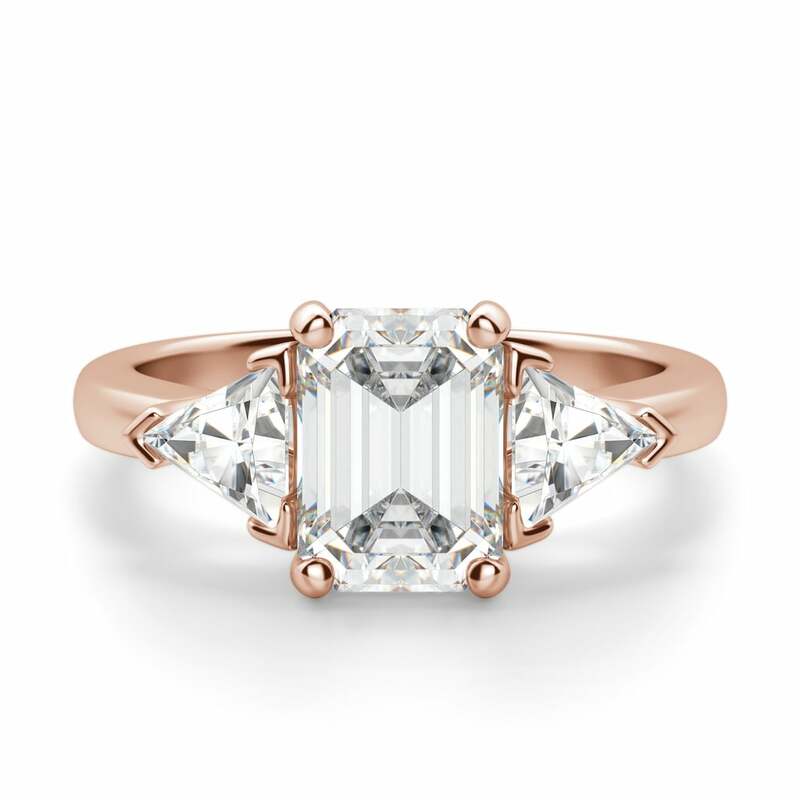 Who says you need a white stone engagement ring? Andrea Groussman's 14kt Rose Gold Diamond Pave and Sapphire Slice Ring ($685) is absolutely stunning. This Diamond Nexus Gypsy Round Cut Engagement Ring ($523) features a 1.49-carat center stone (lab diamond) in a round brilliant cut, and it comes in either a yellow gold or white gold band. 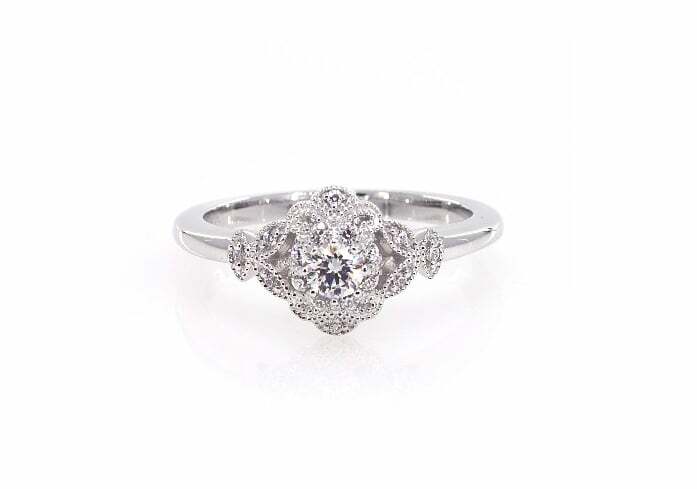 Everything's coming up flowers with James Allen's 14K White Gold Sculpted Flower Engagement Ring ($1,000). 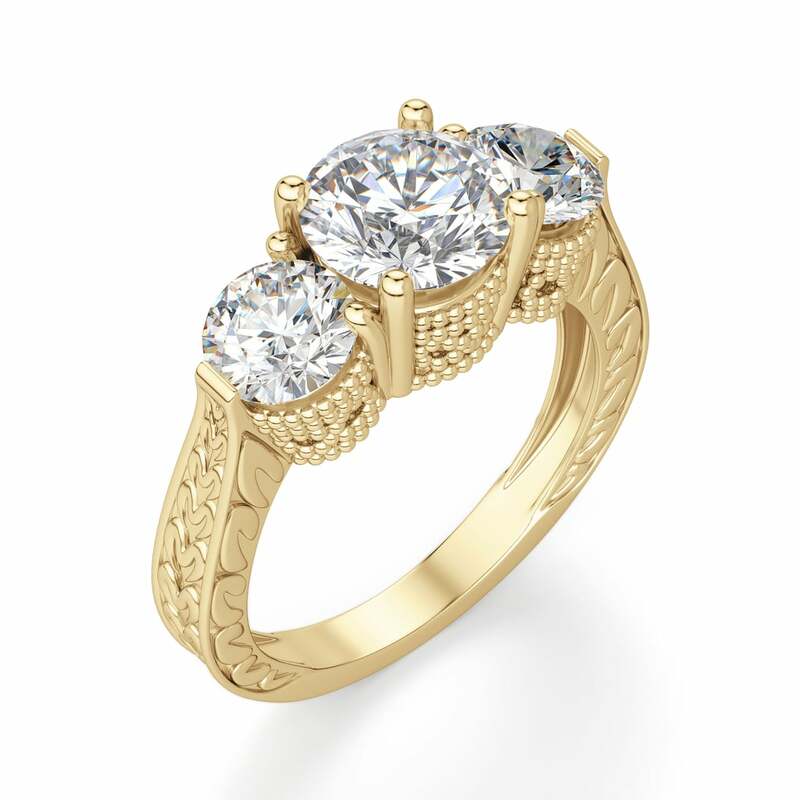 It features a floral halo design with 17 diamonds that weigh in at .26 carats total. Anyone who loves a good baguette will fall head over heels for Andrea Groussman's 14KT Rose Gold Diamond Pave and Diamond Baguette Ring ($900). 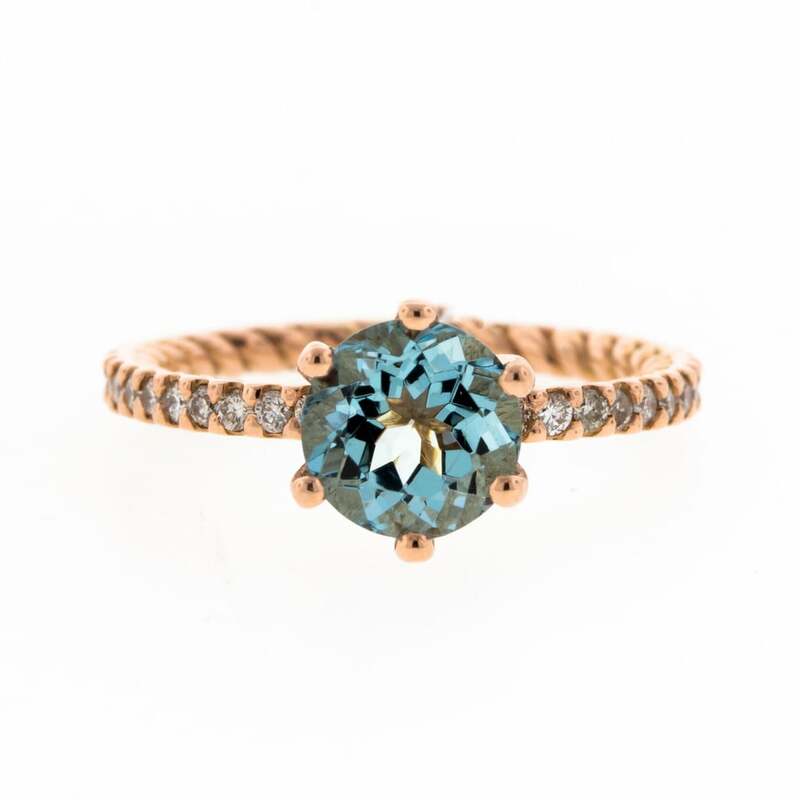 This Rose Gold & Aquamarine Engagement Ring by Concierge Diamonds ($965) can be customized to your — or your partner's — exact preferences!